"With two delicate hammers, Carey played with the precision and flair of a fine weaver at the loom." "Every so often, an autoharpist comes to our attention who is equally proficient on other instruments. 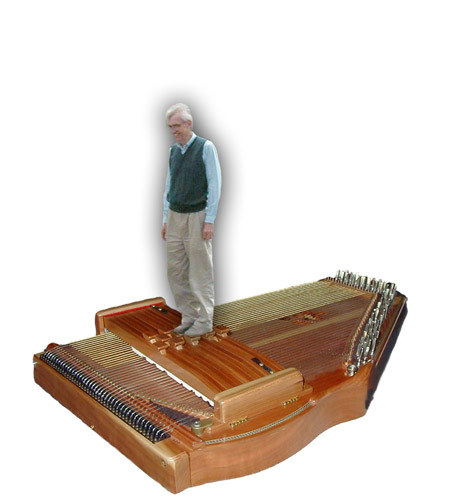 Carey's musicianship, on either the hammered dulcimer or the autoharp, is clean and innovative as well as being so comfortable to the ear that it is easy to overlook the incredible skill that creates it." "Carey plays really beautiful music." "Carey's bass lines are incredible. How does he do that?" "Carey's approach to playing the hammered dulcimer is like that of an accomplished classical musician. It's an unusual blend of both right-brain and left-brain activity that appears to first dissect each and every measure in the piece and then put it back together with great artistic sensitivity and tremendous respect for both the instrument and his material." "Carey has a feeling and musical touch which transports me to woods with the sun shining thru the leaves onto the green moss on the forest floor. I expect at any time to see a wood nymph peek at me from behind one of the trees.. Whichever instrument he's playing, the music is captivating." "He’s really a very nice boy."